Actor David Suchet will be reading the entire Gospel of Mark at St Paul’s Cathedral, just before Holy Week on Tuesday 28 March. The evening will be a dramatic reading of the Gospel, without commentary, read by one of the great actors of our times. The tickets are free through Eventbrite and the 2,000 capacity is likely to be reached very quickly. David Suchet is one of the best-known and best-loved actors of his generation. He has worked for the RSC, in the West End and on Broadway, and his most famous role is Hercule Poirot in the long-running television series. In 2011 he was awarded a CBE for services to drama, and in 2014 was given a lifetime achievement award by the Royal Television Society for his performance as Poirot. Raised without religion, he was converted by reading Romans 8 in a hotel Bible. A practicing Anglican, he has made highly successful BBC documentary series following in the footsteps of St Paul and St Peter, is Vice-President of the Bible Society and his best-selling audio book of the Bible, released in 2014 by Hodder, fulfilled a 27-year ambition. 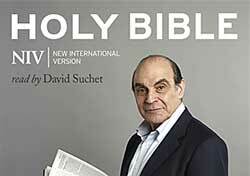 The Complete NIV Audio Bible: Read by David Suchet has sold over 25,000 copies across the MP3 CD, MP3 downloads and app formats.